Before ATOPALM became the #1 best-selling dry skin care in Korea, it started as one simple product created to treat ectopic dermatitis in babies and children. In fact, MLE itself was only discovered due to a father’s desire to heal his sons of their eczema! ATOPALM founder Dr. Park found that all of the existing treatments for atopic dermatitis had harsh side effects, including thinning of the skin. He set out to find a treatment that would heal his children’s skin without adverse effects, and what he found would change the world of skin care. This discovery was a MLE (Multi-Lamellar Emulsion), an ingredient that perfectly mimics the skin’s natural lipid structure. Not only that, it allows for quick and thorough ingredient absorption, which means that all of the skin care products containing MLE would work more efficiently. Today, ATOPALM is respected and beloved around the world, but many people don’t even realize that it can be used to treat the skin of babies and children! Our original product, Intensive Moisturizing Cream, is one of the safest and gentlest ways to heal and protect the ultra sensitive skin of our youngest loved ones. 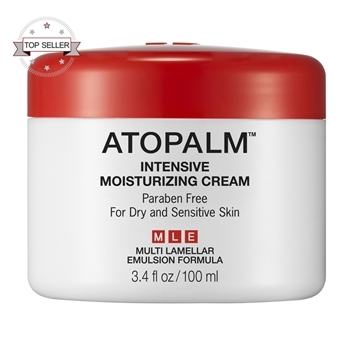 ATOPALM MLE soothes and calms dry skin and sensitive skin without the use of parabens or other harmful ingredients. It isn’t greasy or cloying, and it provides instant relief, which makes it great for use on children. Lastly, ATOPALM is dermatologist and ophthalmologist tested, ensuring safe use on your little one’s skin. Your baby deserves the best in everything, including skin care. You don’t have to settle for cheap baby wash just because it’s the norm! Caring for the delicate skin of children takes more than drugstore oatmeal creams; what your child needs is true skin care. Don’t take our word for it; try ATOPALM Intensive Moisturizing Cream on your child’s skin and see the results for yourself. Shop today to claim a special low price, available only on ATOPALM.com.